My father raised me on film, through his own passion for the art. He was born in the late 1930's, and his geographic proximity to Hollywood put a sparkle in his eye that has lasted his whole life. He is also an artist, and his proximity to the art world has given him a special insight into how film's light pushes through the spectrum separating popular culture, fine art, and everything in between. Though retired for many years, my dad - a Golden Bell award winning teacher - can't stay away from the classroom. His new course, 'Fantastic Films,' hits 9 high points in cinema from the early 1930s, up through arguably the last great epic of Hollywood's golden age. When I heard about his new class, I pitched him an idea: for each week he screened a film, I'd watch that film, pen a short essay, and email it to him just prior to his course. This was homework borne from my pure love of the medium, a love passed down to me through him. I dedicate this list to him. 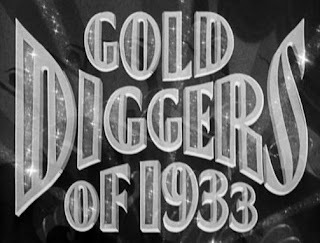 It might be said that ‘Golddiggers of 1933,’ a backstage farce tent poled by epic and elaborately staged musical numbers, belongs to legendary choreographer Busby Berkeley. It is, after all, his fantastical and elaborate choreography that has influenced decades of musical numbers on Broadway and on film. ‘Golddiggers of 1933’ is a seminal film of its kind, arguably the apex of pre Hollywood film code creativity. Part of the reason is the inclusion of some timeless tunes: "We're in the Money" being the most well known, with a riveting sequence where the luminous Ginger Rogers sings the refrain in pig latin. Golddiggers is a smorgasbord of entertainment, alternating between adoring close-ups of beautiful showgirls to the vast, amazing sets they inhabit. The film is meticulously crafted but lightweight. And then, toward the end, a serious, poignant number ‘Forgotten Man’ (an ode to depression era war veterans sung by Joan Blondell) makes this film something really special. This film is escapism at it's finest - it hits the heart, the funny bone, the libido, and does it effortlessly. Modern Times still resonates today and entertains, making it not just a fantastic film, but an important one. Everything Modern Times shows us about the plight of the modern worker hasn't changed much in the eighty years since it was made. 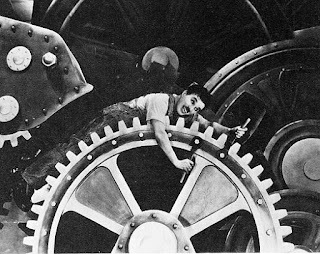 From the opening shot of sheep (comparing herded animals to commuters), to the portrayal of a modern factory using innovation to enslave its workers, Chaplin's last film of the silent era was not silent in its pointed satire of post-Depression anxiety. Though Modern Times is a light romp, it dares to dig beneath its slapstick surface to explore themes like how common workers bear the weight of of increased efficiency and profit in the workplace. Like another mostly silent classic from the 20th century, Jacques Tati's "Playtime," "Modern Times" is a pointed satire about modern life that has no interest in preaching, just entertaining. The nightmare of the opening gag - a screw assembly line, is uproarious slapstick, brilliantly executed, but it's also ghastly. When the factory tests an eating machine on Chaplin, allowing him to work and eat simultaneously, we laugh and cringe at the same time. After this automated eating machine accidentally feeds metal bolts to Chaplin, it's clear the modern workplace can't tell the difference between genuine sustenance and the nuts and bolts of work life.Chaplin is surrounded by ghastly but uproarious devices in the factory, and by the time he suffers his mental breakdown, he is just another twitching cog in the machine. Even Chaplin's character's bathroom break is short lived, interrupted by the boss man on the giant screen. It takes Chaplin falling into the bowels of the machinery itself for an opportunity for a break, but by then, he's lost his ability to differentiate between work and play. His nervous breakdown is not surprising. Once Chaplin's wayward tramp is sent to prison for accidentally stumbling on a union march, he finds jail a much calmer and happier place. Food is plentiful. His cell is quiet and free from distractions. From his release to the end of the movie, Modern Times shifts gears completely from the Orwellian nightmare of the first third of the movie, as Chaplin chases a series of episodic, nomadic misadventures. He meets a girl. He moves from job to job, struggling to find meaning in his life. It's unclear whether he finds meaning, but the end of the film, as he and his love walk into the sunset, it's as close to a happy ending as one might expect... but it also feels much like a wary and uncertain warning about the future. There is a moment right at the end of Casablanca, where the morally challenged Renault (played by the marvelous Claude Rains) drops a bottle of Vichy water dismissively into the trash. It's one of many uncommonly noble gestures from the morally challenged menagerie of refugees and corrupt officials in Casablanca, and the last in a series of Casablanca's perfectly mounted symbols. It's easy to imagine how this movie, which has since been reduced to a series of famous quotes and images, must have hit the public hard upon it's release. Just two day's after Casablanca's New York premiere, the pro-Vichy outpost in Africa's French Somaliland surrendered to the Allies. The tide had begun to turn against the Nazis, battle by battle, but the war was far from won. This subtext - an uncertain future in a world at war - no doubt helped Casablanca win Best Picture. What makes it a great film, though, is literally everything about it. The legendary Humphrey Bogart has chemistry with everyone on screen, particularly Claude Rains and Lauren Bacall. The script delights in hitting notes of absurdity, poignancy and hard edged cynicism without breaking a sweat. Casablanca is all this, and a quite effective piece of wartime propaganda, edited and acted skillfully. It's even a character study - Humphrey Bogart's Rick spends most of the film veiling his good nature to hide the refugees around him from a similar pain as his. It's his triumph, though - his willingness to put the love of his life on a plane for the great good, his willingness to 'stick his neck out' that makes us cheer. When Captain Renault tosses that bottle of Vichy water into the trash, and he and Rick walk down the tarmac into the fog, it's a moment of cinematic splendor richly earned. In an aerial shot near the end of Brief Encounter, Celia Johnson's Laura sits, smoking and forlorn on a bench, beneath a war monument in a city square. Laura is framed in the shot as a besieged woman, set upon by guns and bayonets, as the statues of soldiers bear down on her. We, the audience, can't help but relate to her shame and misery, and, as we are meant to, we judge her. As she berates and doubts herself, we judge her and yet share in her doubt. As she allows herself to succumb to a misty eyed reverie, we wonder if romanticism has her better nature, yet we just can't help but feel for her. She is a good woman, after all, and Celia Johnson's impressive acting keeps us moored to Laura's plight for the duration of the film. The foil of Brief Encounter, the force that bears down on Laura and her might-be lover Alec, is ethical judgment. Laura casts the same critical eye on herself, as she stumbles into the impassive Alec and questions and berates herself at every turn. 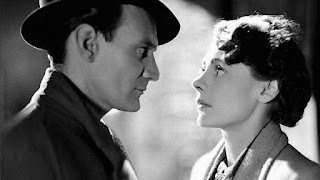 Brief Encounter, through well paced and humane scripting, and tightly controlled camera work, puts us through her paces and compels us to identify with her. Brief Encounter is a story of two married people who meet in a train station cafe and fall in love over a very short period of time. Their flirtation is comprised as a series of brief encounters, each of which appears to resolve itself in fait accompli. The problem, of course, is that both Alec and Laura are so moored in their lives, their families, that the very premise of running off together is absurd. Laura and Alec both see the absurdity of their own situation. Every time is seems clear that Alec might be discovered as a womanizer, he produces a self effacing soliloquy that seems to affirm his own self doubt. Every time that Laura's plight seems one of her own doing, the script gives her a chance to explain and redeem herself, or the camera lingers on her face long enough for us to understand, and love her in our own way. It is this marriage of camera and script that allows Brief Encounter to persevere. It gives the film most of its balance and precision. Celia Johnson's face carries the rest of it. When Laura races from the cafe to ostensibly hurl herself in front of the speeding express, the camera tilts and sends us off balance for the first and last time in the film, and we feel every second of her despair. When at long last, Laura's plain but well meaning husband pulls her from her film long reverie and entreats her to return to him, we feel a great relief, but also the full weight of the finality of her decision - its goodness and its tragedy. 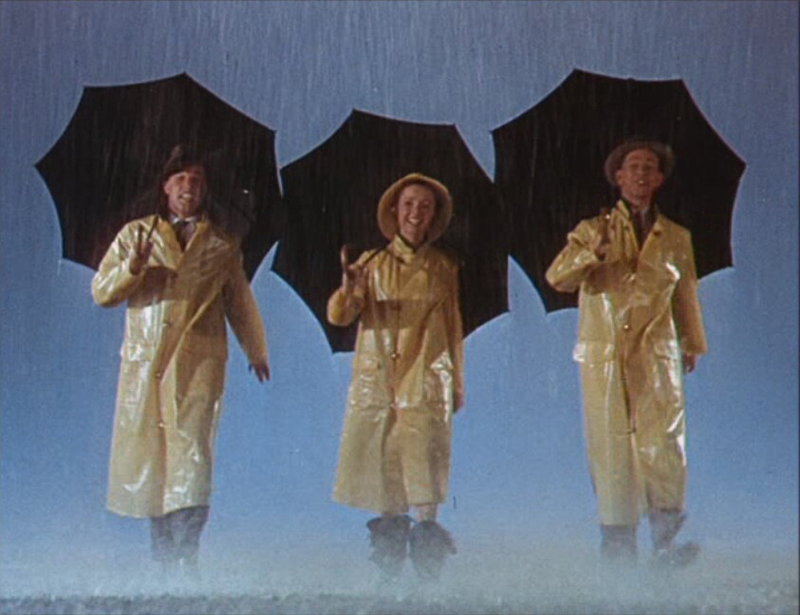 In films like Singin' in the Rain, dancing, singing and smiling look effortless and magical. The best performers and choreographers prevent us from seeing all the blood, sweat and tears behind the scenes, and the famous perfectionist Gene Kelly produced his share backstage. He cared more about a perfect routine than sparing the feelings of his co-stars. That perfectionism, however brutal, is what makes this a Gene Kelly movie. Comedy, singing, and dancing all require enormous talent and concentration, and doing all three is impossible to pull off without incredible discipline. Gene Kelly was a legend for mastering this juggling act, and for demanding it from everyone around him. Singin' in the Rain is a lean film, and a light film, but the performances are full of such tightly controlled energy and concentration that it's impossible to look away. The visuals and choreography are endlessly inventive. The love story almost doesn't belong. But this is a comedy, after all. The performances exist solely in the service of the broadly played characters, and exaggerated mugging and movement, and these broad strokes don't feel out of place at all. Singin' in the Rain is a farce, and a satire - a movie about Hollywood, by Hollywood, and contains at least three legendary musical numbers. It was thereby destined to become a classic. It's worth nothing that similarities between this movie and another Gene Kelly dance classic, An American in Paris, abound. Both movies feature ambitious dance numbers in the final 20 minutes. The Broadway Melody of Singin' in the Rain serves as a showcase for Gene Kelly's considerable talent, and although not nearly as breathtaking or inspired as the epic number that closes out An American in Paris, it still impresses, jazz hands and all. The Wages of Fear is a slow burn, claustrophobic thriller about desperation and human weakness. It charts the consequences of placing vulnerable communities at the mercy of the multinational corporations who exploit their resources. 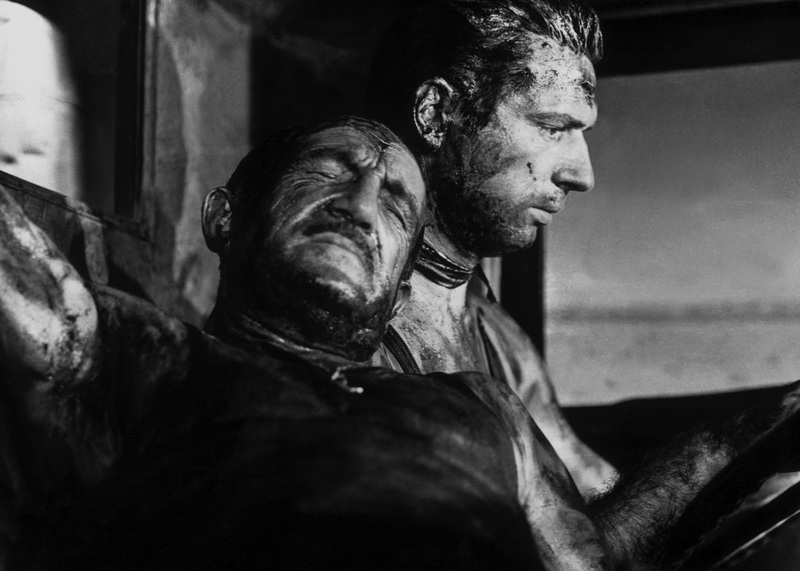 The Wages of Fear is also a study on the breaking point of the human soul, and a difficult look at poverty and how it sidelines people from their potential and makes them into people they can’t stand to look at in the mirror. Lastly, it’s an incredibly accomplished white knuckle thriller that earns its tension, moment by moment, like almost no other film in its genre. This film opens in the hot, anxious squalor of Las Piedras. In steps characters who have reached rock bottom. They treat each other miserably. Mario, Jo, Luigi and Bimba all fight, bicker, strut, drink, scheme and toil for the first hour, and when we realize how few options are available to them, the film slowly places its fingers carefully around our throats and begins to tighten. The Southern Oil Company burns through the men of Las Piedras like it burns through oil, but even the corporation avoids the tramps of Las Piedras like plague rats. Only when an oil field fire threatens the bottom line do the oil executives scheme to bring in a few expendable men for a deadly task. One Italian drifter hangs himself when he learns he will not be chosen for the job. It is this impossible choice - between one kind of death and another - that permeates the lives of these men. Mario, Luigi, Bimba and Jo, tasked with hauling tons of nitroglycerine, have another impossible choice, between the unbearable status quo and the minute possibility of freedom. Though all these men are very unlikeable as they climb into the trucks, they are also faced with impossible odds, so we cheer for them despite our misgivings. Their dreams simmer so far below the surface that they have all reduced themselves to caricatures, but as the trucks roll forward, we see those dreams sputter out like exhaust. Then, as the the movie unfolds and these men are placed further and further from survival, we see their dreams more clearly. Their humanity slowly emerges as they come close to death. When death does hit, we are at once shocked and not surprised. This moral ambiguity is excellently conveyed, through slow but deliberate pacing. Through the straight but vibrating washboard road, up the switchbacks, over the unforeseen tree branches, and through oil slicks, the threat of sudden death hangs over every second of every scene, and the cinematography leaves no doubt as to where the trucks are at any given moment, or where the biggest challenges lay. The Wages of Fear is not like any modern thriller, because we feel moral ambiguities permeating its structure, making every death count. The final death in Wages of Fear is earned in a most unexpected way, after the dangers have supposedly abated. How are we surprised, though? The last survivor is a dead man walking, his fate sealed like the others’ fates, only delayed. Jacques Tati is recognized for just a handful of films appreciated all over the world. When you consider the pop culture impact of other great films from the 20th Century, Tati's oeuvre seems more focused and less cluttered. Tati was a perfectionist, a genius, and a true visual artist - a painter in motion. The strokes of his brush are fine, minute, and complex, but if you stand back and deliberately blur your eyes, you may not see much. 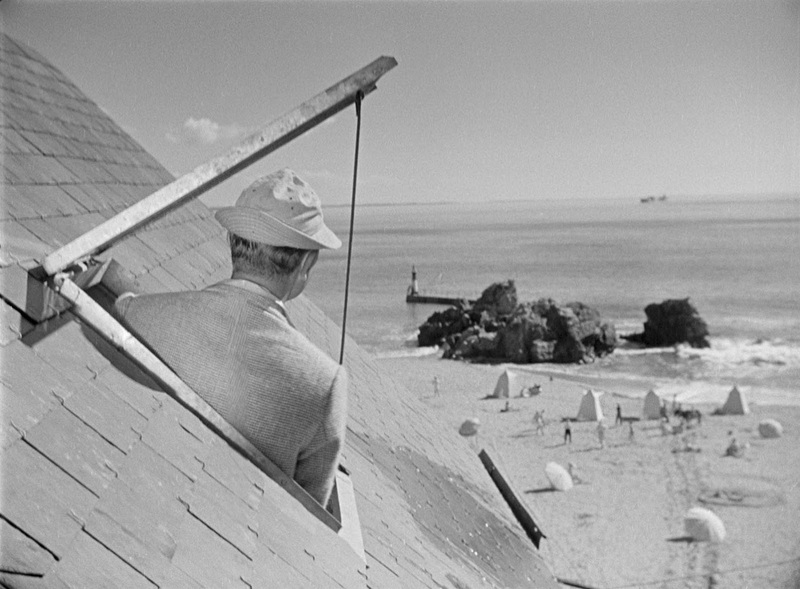 Nowhere is this more the case than Monsieur Hulot's Holiday. Tati began his career in the cabaret, where he fostered his skill as a brilliant pantomime performer. World War Two, in which Tati saw battle, intervened and spit him and other soldiers back out to a world grappling with the consequences of machination, war, and post war politics. This juxtaposition impacted every one of Tati's subsequent films. His thesis, setting the modern world against a less complex time and place, would inform the rest of his career. 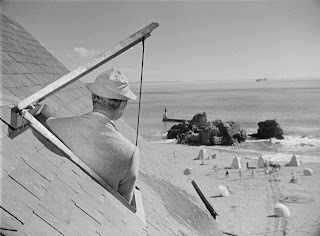 Tati's second major film, Monsieur Hulot’s Holiday, seems sparse and languid at first glance. At closer inspection, it is neither of these things. All of Tati's films - including Holiday - seem to unfold in real time, but are meticulously constructed. This is a testament to Tati's editing genius. Holiday is less complex than any of his subsequent features, but bursting with sight gags and understated hilarity. Unlike later films like Mon Uncle and Playtime, which are set in the modern world and cast Hulot as the unwitting foil, Holiday is set entirely in the old world, and the unwitting foils are the accoutrements of the modern world, intruding in fits and starts. The visual comedy abounding in M. Hulot's Holiday never feels forced, and never has to be explained, which is something a lot of contemporary comedy might learn from. The situational set pieces - a gust of wind, a swiveling chair, a beachside changing room - are timeless. A boat capsizes and its rudder rises up like a shark fin, chasing away the beachgoers. A tire falls off a car, becomes a wreath as it picks up leaves along the ground, and rolls right into a funereal procession. Firecrackers go off inside a sleeping couple's bedroom and fly out the window like mischievous spirits. The Hulot character - so recognizable that a mere silhouette gives him away - is the catalyst for all these mishaps, yet he does nothing maliciously, nor do any of his fellow tourists hold a grudge for too long. The existence of chaos in Hulot's world helps us to appreciate the peace. The peaceful surroundings help make the chaos interesting. Disorder and serenity continually collide this way in Saint-Marc-sur-Mer, from the first day to the last, and are portrayed as necessary partners. As Hulot and the other tourists pack their bags, say goodbye to one another and drive away, it's clear that we’ve shared this vacation with them entirely, along with the slight pang of regret that hits on returning to 'real life.’ This underpinning of melancholy - to which Tati was no stranger - is slight but intentional, and elevates and already brilliant film to something transcendent and timeless. Antoin Doniel, the young, wayward boy at the center of this film, is sowing his oats, but Antoin is portrayed as a lost young soul rather than a careless hellion. Antoin and friend Rene (a character based upon another real life person, Truffaut's lifelong friend Robert Lachenay, who assisted Truffaut in making The 400 Blows) may come off as frustrating and flip, but they are not awful kids. They are not unintelligent and are soft spoken. Make no mistake, they're up to no good, but their behavior all speaks to attempts to define their life and fulfill dreams for future success on their own terms. They do raise hell, by way of their nonchalance about lying, stealing, smoking and playing truant. They do all this because they’re caught between frustrated teachers, self involved, hypocritical, half-hearted parents and their inner confusion about their own dreams for the future. Antoin’s biggest problem is that his dreams are not developed or pushed along or encouraged by a single living mentor, so he is, in essence, raising himself, and making all the mistakes that come with that. Antoin is not aware of his own frustrating predilection for truancy and petty crime, because there is no moral compass for him to follow. Halfway through the film, Antoin's mother appears to briefly step into a more caring role, but it soon is clear that this loving persona is just another part of a strategy to placate Antoin and bribe him away from habits that no single night out on the town will cure him of. I’ve heard The 400 Blows described as a brutal film, but I don’t think this is true. Truffaut gives us a clinical look at what a rough childhood looks like from his own perspective, but since it’s stripped of garish sentimental strokes that might create outlandishly cruel or saccharine predicaments for Antoin, it’s easier to understand how all the moving parts operate and why these kids and the systems they drift through are the way they are. The school system, justice system, and social programs struggle to impose order on kids they feel are out of control, though for some of these kids, a little genuine engagement, rather than discipline for discipline’s sake, is all it would take to set things right. 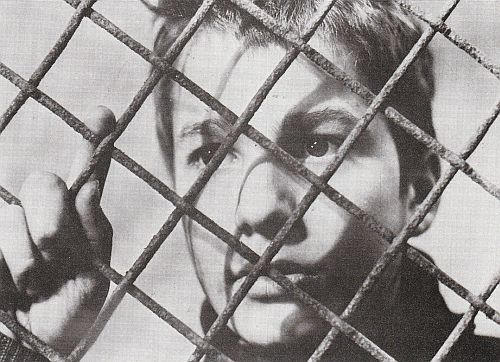 It’s not surprise to me that The 400 Blows ends on such a striking but minor note. This final shot, of Antoin at the ocean, staring - almost pleading - into the camera, is not a thesis statement, not an answer, not a solution, but rather, a testament from Truffaut himself. If David Lean's sprawling, assured masterpiece was released today, it would be packaged as two separate films, as is the normal custom now with epics. Looking at Lawrence of Arabia objectively does in fact reveal two very individual films. Part one is an adventure structure, and part two is a wise, literate cautionary tale about the indelible complexities of war. Based on the life of the remarkable T.E. Lawrence, David Lean has taken an already extraordinary life and shaped it into a complex tale of adventure and political intrigue. The film presents us with multiple sides of an epic conflict and does not take sides. This is no propaganda piece; rather, it's a treatise on man's capacity for greatness and for horror in the midst of war. 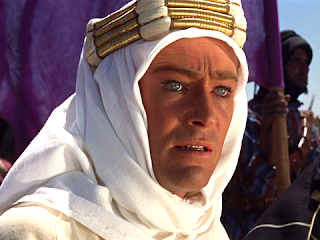 Aided by Maurice Jarre's legendary soundtrack, and defining visuals which left a permanent mark on film, Lawrence of Arabia is the defining epic of the twentieth century. Part one starts with Lawrence's death (by motorcycle accident) and subsequent funeral. Various men discuss his greatness at length, but when the film cycles back through the years and we see Lawrence for ourselves, he is idealistic, overconfident, and unprepared. He gets sideways glances from his peers and is disrespected by his superiors. Recognizing his knowledge of the Arabian Peninsula, they send him to the desert to meet with a Prince Faisal (played by screen legend Alec Guinness) in order to gain strategic upper hand in the region. This first, sprawling section is a crowd pleaser, set in an impossibly gorgeous landscape where the sun is something to be feared and the sands dunes stretch out like a shimmering ocean. Lawrence, the underdog, is dropped into the region for a thankless mission and gradually undergoes a remarkable transformation, one achieved through a series of adventures, each one more visually stunning than the last. Lawrence achieves the impossible and comes out the other end of the gauntlet a changed man. Part two drops us into a guerrilla war, among traitors and stubborn leaders and cacophonous councils By now, Lawrence has allies, is cunning and courageous. But he's also headstrong and quite unprepared for the deeply complex politics of the world he finds himself in. While it's gratifying and exhilarating to watch the adventure unfold and Lawrence prove himself, it's just as distressing to recognize that the spoils of war are not always what we expect to be. Some of these rewards can end up eating at us from the inside.